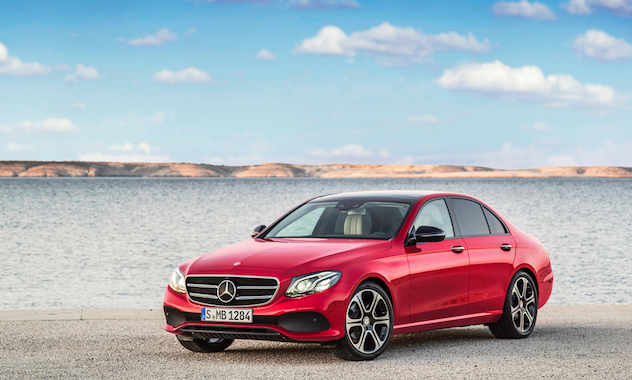 The automotive experts call the 2017 Mercedes Benz E300 4Matic a mid-sized sedan. This bland description covers a field of offerings that includes flavorless grocery-getters, horsepower crazed wannabe racecars and just about every car in between. The challenge to Mercedes Benz was: how do we stand out in this crowded field? After our test drive in the E300, the answer seems to be, let’s stay loyal to our core clientele. Power to the People – Race fans know that in Formula One, Mercedes Benz not only wins races, they dominate. When the rules required smaller engines with turbo-charging, their engineers built a power plant that developed more horsepower, was more reliable and used less fuel. As a result, no team has come close to Mercedes Benz’s Formula One performance. This should make the prospective Mercedes Benz buyer smile because, in racing as on the street, the heart of any car is the motor and the new E300 4Matic’s heart beats with turbo-boosted power. Luxury with a Dash of Sport – The new E300 motor is a turbo-charged 2-liter, four cylinder, 241-hp affair that powers the almost-two-ton cruiser from zero to sixty in about six seconds. However, this performance doesn’t just come from the horsepower; you can also credit the nicely mated nine-speed transmission and 273 lb-ft of torque – torque being another benefit of turbocharging. Purists may lament the loss of their silky-smooth six cylinder E350 but the real-world “get up and go” along with gas mileage improvements should help quiet naysayers. Behind the Wheel – Inside the new E300, you immediately know that this is a Mercedes. Real wood, brushed aluminum and impeccable fit and finish greet your eyes. But don’t be fooled that the seats and other interior pieces are leather clad – it’s something called MB-Tex. While it lacks that old clubroom smell, it’s still beautiful and practical. Naturally, leather is available at about $1,700 and most E300 buyers will be tempted t this added luxury touch. The front buckets caress you in all the right places. They hold you firmly in a tight corner or comfortably on long trips. Visibility out of the expansive “green house” is obstruction free – great for safe driving on our crowded Metro Area roads. Speaking of roads, the suspension has been tuned by the engineers to deliver a firm and controlled ride. In an accident-avoidance move or briskly driving your favorite back road twisties, the E300 moves like an athlete – all without punishing the occupants. Our test drive took us on highway and country back roads and every mile brought a broad grin. Technology – We Got That – Mercedes Benz USA has been referring to the E300 as the “World’s Most Technologically Advanced Vehicle,” and rightfully so! The car company has taken a quantum leap forward in enhanced safety technology. Here is a list that has to be experienced to be believed: Drive Pilot with Lane Change Assist, Active Brake Assist, Evasive Steering Assist, Remote Parking Pilot. They even have a “pink noise” generator to protect your ears from the sound of a crash. How they work and what they do is nothing short of amazing. A Convincing Test Drive – If you are a fan of the Mercedes Brand or have always been intrigued by the marque, a test drive in either the Sport or Luxury model (each offers slight styling variations) may convince you to take the leap. It certainly impressed us. You can now view and test-drive the all-new 2017 Mercedes Benz E300 4Matic at Benzel-Busch. To make an appointment and view inventory online please visit their website at www.benzelbusch.com.